The Rokit is in a class of it’s own, totally different from others. It’s specifically designed profile and steering system puts this wing on a tip with ease at the same time automatically self centers. Utilizing Mike Campbell-Jones long running experience in soft wing development Paramania have taken wing design to a whole new level. In the hands of experienced pilots this is the most versatile wing, pecializing in precision and speed with 100% reflex ability to cut through low level turbulence yet is still simple and easy to use. Fly high and let the trim out to full Reflex with speed bar for maximum speed in a straight-line. Depending on wing load and thrust the Rokit can be very fast. This wing comes standard with micro lines on the upper cascades, new WTS steering system, a modified version of Composite Leading Edge (CLE). The risers have a fast trim mechanism that can slow the wing in an instant and the speedbar can be used in all trim positions with impunity. This is known as the PK system. The Rokit glider is 36m, it has 58 cells, it can be flown solo or tandem. We have integrated new WTS system, Trailing edge air vents to help, fast inflation & launch. 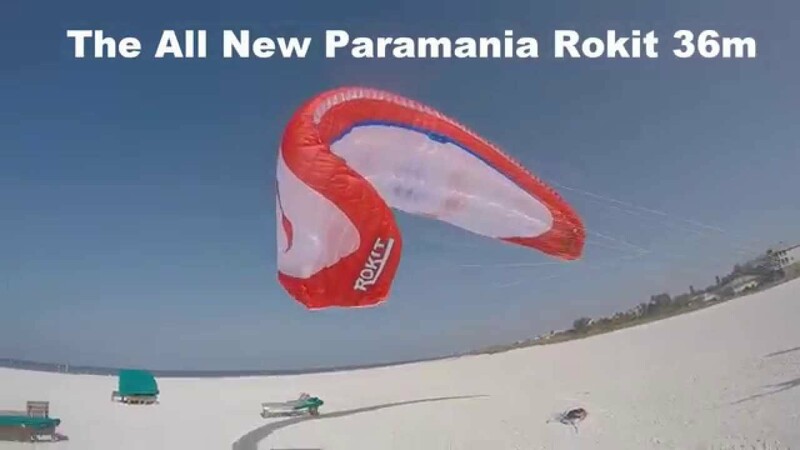 Click the button below to add the Paramania Rokit Paraglider to your wish list.